The Gold’s Gym Trainer 720 Treadmill with model number GGTL59613.0 has all the expected features a treadmill in its category should have. It is a budget-friendly treadmill that allows you to acquire one of the best treadmills for home use. You should be able to walk, jog and perform light running on it because it has a decent tread belt size and a G-Force 2 Commercial motor that could withstand the pressure. It is solidly built to support up to 300 pounds/136 kg maximum user weight and able to withstand any intensive workouts without a stability problem. 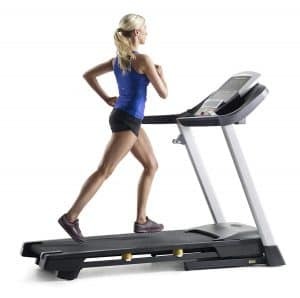 As a matter of fact, this treadmill is one of the few inexpensive treadmills that offer an opportunity to a user to perform running exercise. Most running treadmills are usually high end and expensive but this one is a good alternative available at a value-oriented price. It has features such as 18 workout apps that automatically adjust incline and speed tailored for achieving fitness goals. It has a speed range of 0 to 10 mph and incline level of up to 10%. These ensure outstanding workout experience. 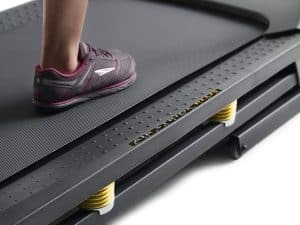 The Gold’s Gym Trainer 720 Treadmill also has a deck cushioning system that reduces the stress effect that is often felt on the joints such as the ankles and the knees thereby making it possible for a user to workout enjoyably longer. A user could also be entertained because the console is MP3 and iPod compatible with built-in speakers for quality sound output. Click right here to have a peek at the discounted price of the Gold’s Gym Trainer 720 Treadmill on Amazon. That said, we are going to further analyze the treadmill bringing the pros and cons to light in order to help you make an informed purchasing decision. The Gold’s Gym Trainer 720 Treadmill is obviously a very sturdy machine. The frame is made from solid steel and it supports up to 300 pounds/136 kg maximum user weight capacity. The steel parts are coated with anti-corrosive and scratch paint meant to preserve them from rusts decay and scratches. The treadmill has overall assembled dimensions of 73.3 inches long by 35.7 inches wide by 63.1 inches tall. These mean that a workout area of 6.1 feet long by 3 feet wide will be required. However, for safety and convenience, it is recommended to leave an additional clearance of at least 3 feet at the rear and a foot on each side of the treadmill. The total workout area should then be around 9 feet long by 5 feet wide in size which is sizable; although, you don’t have to worry about the workout area if you have space problem because the unit is foldable. You mustn’t have a dedicated workout space for it since you can temporarily use it on a space and fold it up when you don’t use it. Fortunately, when folded, the size is reduced significantly even though it is not overly compact to fit under the bed or in a standard closet but enough to securely put it away. The folded dimensions are 34 inches long by 36 inches wide by 65 inches tall. The tread belt size is spacious enough to provide a convenient running experience without having to be too careful about foot placement. It has a running surface size of 55 inches long by 20 inches wide. The tread belt is a 1-ply industrial high quality running belt. The deck also features a 2-cell Airstride Cushioning System that ensures a soft landing of the feet during workouts which reduces stress to the joints. In other words, this cushioning system is the shock absorber that absorbs about a quarter percentages of the workout impacts on the joints. However, the folding and unfolding process is done manually unlike some treadmills that do that automatically due to the SoftDrop and EasyFold mechanism that are integrated into them. Therefore, you must be careful when folding and unfolding the treadmill in order not to drop the deck. It is a very stable treadmill because of the weight and the base framework. It weighs about 200 pounds/90.7 kg while it is integrated with non-adjustable stabilizer bars at the front base and adjustable rubberized feet at the rear base. The front base stabilizer bars are also integrated with transport wheels that make relocation easy and simple despite the weight of the treadmill. The term used for the motor capacity that comes with the Gold’s Gym Trainer 720 Treadmill is ‘’G-Force 2 Commercial motor’’. We have observed that some people do not really understand that better than they would if the capacity was measured in ‘’Horsepower’’. For this reason, we are able to get the equivalent motor capacity in horsepower which is 2.6 HP commercial grade motor. This supports prolong and intensive workouts without the risk of overheating or breaking down. As far as walking, jogging and light running are concerned this motor has your back covered. Just as aforementioned, the motor can execute speed up to 10 mph. Many users have expressed satisfaction as to the quality of workouts they were able to experience with the treadmill. There are two ways to adjust the speed and that is by using the speed buttons with 1, 2, 3 to 10 mph, which offer the possibility of 1.0 mph speed increment and the second way is by using the speed button with the sign +/- which offers a gradual adjustment of 0.1 mph. In other words, speed increment by the quick speed buttons is 1.0 mph and by gradual speed adjustment button is 0.1 mph. The motor is not only powerful but also smooth and quiet during operation. It emits the normal sound every good treadmill does especially when on a high speed. A user won’t be bothered by it neither is the family or the neighbors be bothered by it. You should be able to watch your favorite TV show or listen to a good music while working out with any unpleasant noise interference. And just for the record, the motor is motorized therefore a power outlet will be required to plug it in for it to work. The Gold’s Gym Trainer 720 Treadmill has a sizable console that accommodates a lot of features. Among the features on the console is the monitor, speed and incline buttons, 18 preset workouts, heart rate sensors on the adjoining hand grips, speakers, fan, accessory/water bottle holders, etc. The 18 preset workouts offer different workout options that could help you achieve your fitness goals. The preset workouts are in 4 categories, namely, Calorie, Intensity, Speed, and Incline. All are programmed to automatically adjust and assign speed and incline according to selected workout option. 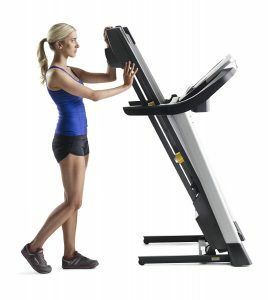 It is also possible to manually adjust the incline and speed you feel it is right for your workout by using the Quickselect buttons. Both the incline and the speed have Quick select buttons from 1 to 10 which allow you to quickly select the desired speed by 1.0 mph for speed and by 1 percent for incline. However, the speed has a button that allows you to gradually adjust the speed by an increment of 0.1 mph which evidently provides you with the opportunity of finding the suitable speed range for a certain workout. The monitor has exquisite LED display with high readability that cannot be diminished even in a poorly lit environment. The monitor displays values in 3 distinguished parts, namely, incline and calories, time and distance, heart rate and speed. Unfortunately, the console is not telemetry enabled which means HR chest strap cannot be used to transmit pulse data to the monitor except via the HR sensors on the hand grips. Then there is the CoolAire fan that is positioned below the console designed to cool off the user during a workout. There are other features designed to make your workout comfortable such as the speakers, the accessory/water bottle holder. These help in keeping water handy for hydration during a workout and listening to good music since the console is MP3 and iPod compatible. There is also a tablet holder just at the top of the fan. The sound volume can be adjusted conveniently via the sound device you are using or through the volume buttons on the console. And yes the sound output might not be the very best in quality when compared to a dedicated sound system but good enough to the ears. Entertainment is no doubt a necessary distraction that could immensely contribute positively towards working out longer and productively. The console is not only rich with features but has a very attractive and appealing outlook. The Gold’s Gym Trainer 720 Treadmill with model number GGTL59613.0 has an incline of 0 to 10%. This means that a user could experience some level of difficult cardio exercises that could burn fat. Just as aforementioned, the incline is motorized and could only be adjusted via the adjustment buttons and when the machine is plugged to a power outlet. There are 10 QuickSelect buttons ranging from 0 to 10. The incline can also be engaged automatically if you choose to use any of the preset workout options and of course you can select your desired incline manually as well via the QuickSelect buttons. The 0 to 10% incline range may not be that much but when used at 7 to 8 mph the user will definitely feel the difficulty and impact. 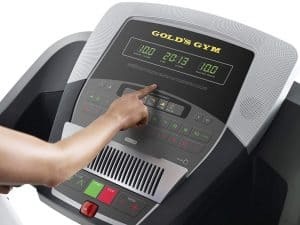 The Gold’s Gym Trainer 720 Treadmill with model number GGTL59613.0 basically has a couple of accessories such as a tablet holder for keeping your tablet handy while listening to good music during a workout, accessory/water bottle holders for hydration and keeping other stuff like keys and remote control. The approval rating of the Gold’s Gym Trainer 720 Treadmill is simply impressive. The majority of its users have nothing but positive things to say about the overall quality and performance of the treadmill. For instance, the average approval rating of this machine on Amazon is 4 out of 5 stars at the time this post is written after nearly 100 users’ reviews. We honestly think that this is a cost-effective treadmill that will be appreciated by most people. The Gold’s Gym Trainer 720 Treadmill with model number GGTL59613.0 is shipping in one neatly packaged box. The shipping cost totally depends on the retailer you are purchasing from; although some vendors such as Amazon provide free shipping and delivery in a couple of days. You will probably spend more time on unpacking the unit than putting it together. This is very true because it comes with the major components preassembled and therefore there are only a few parts to be attached such as the console mast, console and connecting the wiring. However, you are going to need help in order not to drop anything. It will probably take an hour more or less to completely assemble the treadmill. The treadmill package comes with an instruction manual and all the tools you will need for the assembly. The Gold’s Gym Trainer 720 Treadmill does not require much of maintenance but needs some level of care. For instance, the belt requires lubrication at some point in time depending on how frequent you use it, and that is why it is being purchased with a 100% Silicone Treadmill Belt Lubricant. Also, the tread belt needs to be kept clean at all times to avoid dirt getting caught in it or the motor. The Gold’s Gym Trainer 720 Treadmill is a decent treadmill that is budget friendly. It also allows a user to perform effective walking, jogging, and light running workouts. There are 18 built-in workout programs that help in diversifying workouts that could ultimately result in achieving the much-desired fitness goal results. We think that this treadmill has enough features necessary for quality workouts and it is also affordable.